Here’s one for fans of lush, romantic slots action – a 5 reel, 9 pay-line online slot from Microgaming that takes you back a world of horses and carriages, masked balls, and dangerous liaisons. 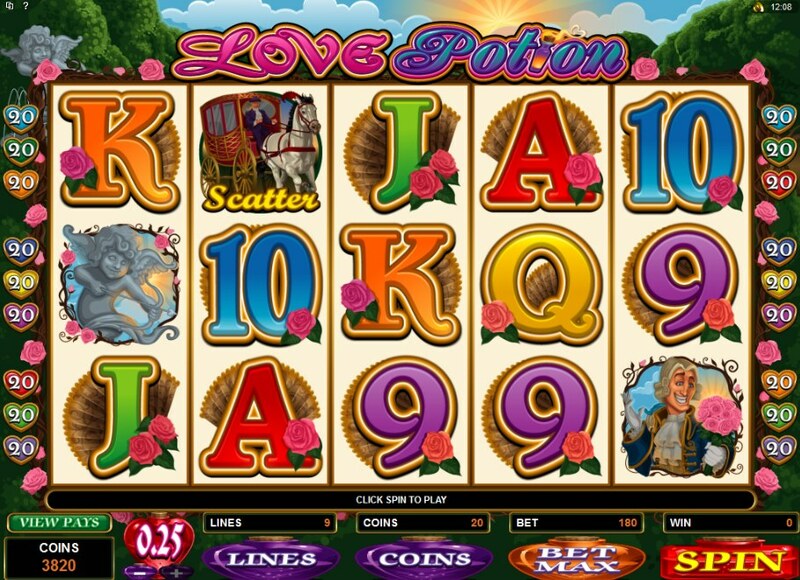 Love Potion at first glance is a bit like Cupid & Psyche, the myth-themed slot from Bally, or the lush Asian Beauty slot, the beautiful Oriental-themed game from the makers of this game that featured great bonuses and gorgeous graphics. The same flowery goodness is on show here: sculpted hedges, roses in abundance, love potions, cherubs ready to chuck their arrows in the general direction of our two star-crossed lovers (both decked out in bouffant to die for), and ornate 9-through-Ace poker symbols. The animations are pretty sweet too whenever a winning combo is formed. Look out for the Love Potion icon, as it acts as the game’s Wild, substituting for all symbols other than the bonus and Scatter. 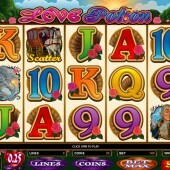 The Scattered Horse & Carriage gifts free spins – 10 of them – when three or more appear on the reels. Not only that, you’ll get a sweet 5x multiplier to go with them. There’s one other bonus game – the Love Struck Bonus feature –which is triggered by two or more Bonus icons across the reels, making this a pretty good feature to trigger. Two bonus symbols gives you two picks in the game with a 1x multiplier, The Love Struck bonus game is triggered when two to five bonus icons appear on the reels. Two icons will award two picks and a 1x bonus win, two will award 3 picks and a 2x on your spin, while 5 bonus symbols awards a massive 100x your win plus five picks. What are the picks? Well, essentially it’s a same-old Pick Me Bonus type game where you have to pick various bewigged suitors for your girl to drag onto the dance floor. Keep picking until all your goes have been used up, and your total win will be totted up before you go back to the base game.